NASTYLIMBCHEAT = Nastier Limb Removal? MADWEATHER = Time Speeds Up? If you have the 1.1 update (came out 27/06/02), the full armor code, turtoise, has been changed to tortoise. Complete 20 fire mission on each island to get a flame thrower at each hideout. Each of these weapons are unlocked at your hideout after getting a certain number of hidden packages. Complete 10 vigilante missions on one island to get a police bribe at your hieout. Complete 20 vigilante missions on each island to get a total of 6 police bribes at each hideout. Complete at least 100 taxi missions to unlock a new, faster taxi. Instead of holding down the sprint button, tap it rapidly and you will be able to run alot further before getiting tired. Steal an FBI car and take it to paint and body. Get it fixed and when you hit the button to turn on the lights while moving, it will have hydros and jump over other cars. Before you start, make sure you have armor and your health is at 100. Drive to the subway down the street from your house save location and drive your car down the ramp and onto the subway tracks turn right and stay on the left side of the track so the subway doesn't hit you. Keep going until you see on the screen 'St. Francis Airport' drive up to the point where the tunnel has a curve park your car on the left side of the tracks, and get out and go to the right side and hug the wall as tight as you can and wait for the subway to come. Once it comes, let it hit you and you might have to move to the right a little once it hits you so that you go through the wall or sometimes you'll fall through the floor. You should see your character falling through this green or blue screen and then the loading screen should come up and say 'Welcome to Shoreside Vale'. You'll fall right outside or near the airport. Note: If you die you'll go back to Staunton Island. Get to Staunton Island at the very beginning of the game. If you want to go to Staunton Island, but don't want to have to complete the missions in portland, then first enter the code chittychittybb. Next, steal a police car and head onto the broken freeway. Go as fast as you can and when you reach the broken part your car will begin to hover. All you do now is just make sure you don't land in the water and then you're in Staunton Island without completing any missions. Start a Taxi Mission, pick up someone, and drop em' off. Now, go to pick someone else up, but make sure they don't get in your taxi until the time is at exactly 0 seconds left. The timer should disappear, but the passenger will not leave your vehicle. You can now continue doing taxi missions without the timer, until you quit the mission or blow up your cab. Complete 35 ambulance missions to get a heart at your hideout. Complete 70 ambulance missions to get an adrenaline pill at your hideout. Get onto Level 12 in an ambulance mission and you will get the infinite run cheat. If you're sick of the regular in game radio stations, you can customize the game with your own MP3s. In the GTAIII folder, look for a folder called MP3. Place all the songs you want into this folder. The next time the game is started, scroll through the radio stations until you get to the last one. A new station should appear, which will play all your personal MP3 songs. Drive up to a taxi in the car you intend to use. Get in the taxi, press and hold CAPS LOCK. Still holding CAPS LOCK, get out of the taxi and get in the car you started with. Let go of the CAPS LOCK key and now you can do taxi missions in that car. Steal a fire truck and begin the Firefighter mode. When you are assigned a new fire to put out, press F1 to start a replay, then F1 again to cancel it. The fire will be immediately extinguished. When in a police car, enforcer, fbi car, or rhino, start the vigilante missions. Drive close to the target vehicle, and press ESC to call up the options menu. Choose 'Resume Game', and when the game resumes, your target will stop his/her vehicle and get out, making them much easier to kill. 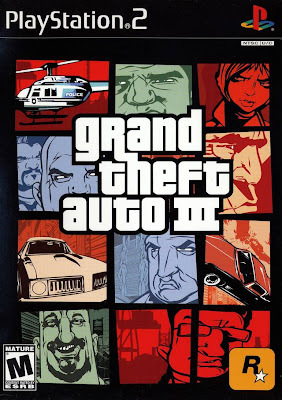 In the GTAIII-directory there should be a subdirectory called data. In this directory, you will find the file handling.cfg, and others, containing the stats for different cars and objects. Here you can change the weight of the car (column A, higher is better) and it's crash damage multiplier (column Y, lower is better, 0 means no crash damage), in order to make any car have the weight of a tank, and take no damage from crashes. The file itself gives good pointers towards which values should be changed, and you should backup any files you intend to edit. The limits mentioned in the file are just recommendations, you really can put in anything you want. When done, just restart the game, and you edited police car will push vehicles like a Fire Engine, and take absolutely no damage from crashing. In your second hideout put in two cars into the garage. Then get out and walk up to the door so it opens. Get into the third car and drive it in before the door closes. Take a damaged car to your garage. Exit the garage, watch the door close, and then open it up again. Your car will be repaired. When the moon is visible at night you can shoot it with your sniper rifle to make it grow larger or shrink. In some missions the objective is to kill members of certain gang. These obviously makes the gang anrgy at you and when you drive or run by the gang members they will shoot and try to pull you out of your car. This can be changed by going in to the program files of your GTA game. In this folder is a sub-folder called data. In this folder is a file called pedstats.dat. Open this in Word or Notepad. In this document you can change the stats of every ped in the game. the ones you are looking for is gang 1-7. As the doc suggests if you change their fear(100 is good), temper(0 is good) and lawfullness(100 is good). Careful you might want to backup this file incase you mess up or want to revert back to the old way it was. Codes can still be entered while the game is paused (at the menu screen). Hit Esc to pause the game, then type the codes desired. The codes' effects will take place once you unpause. This trick does work for entering multiple codes at once, and is especially useful when you must enter codes quickly.